Thomas E. Perez is a Harvard-educated lawyer, and a first-generation Dominican American with a career in public service. The former secretary for Maryland's Department of Labor, Licensing and Regulation, Perez also was the first Latino to be elected to the Montgomery County Council and, in 2005, to serve as its president. A graduate of Harvard Law School and Harvard's John F. Kennedy School of Government, Perez was a Justice Department attorney for 12 years prosecuting civil rights cases and was a deputy assistant attorney general in the Clinton administration. Perez also worked during the Clinton administration as director of the Office of Civil Rights at the Health and Human Services Department. He was previously on the staff of the late Sen. Edward Kennedy (D-Mass.). Perez spent his career in liberal activism before entering elected office as a Montgomery County, Md., councilman in 2002. Prior to running for office, Perez was the president of Casa de Maryland, a Latino advocacy group that admittedly served immigrants regardless of legal status. The group attracted financial support of George Soros and Hugo Chavez’s Venezuela after Perez’s tenure as president ended. CASA received more than $750,000 from groups linked to the billionaire hedge fund manager, as well as $1.5 million from Citgo, the state-owned oil company that helped make the socialist dictator a billionaire. 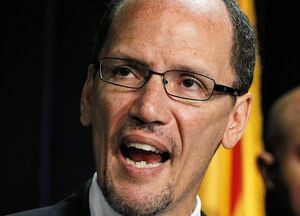 A top union leader who worked closely with Thomas Perez, President Obama's nominee for Secretary of Labor, says Perez can bring labor and progressive firms together, as he did in Maryland. Creating such alliances is one reason Perez "was a great secretary" of Labor, Licensing and Regulation in Maryland, adds Fred D. Mason, Jr., president of the Maryland-D.C. AFL-CIO. "Plus, he understands workers' rights are human rights, and he's a human rights advocate," Mason adds of Perez, whom he worked with for years. On March 18, 2013, Obama named Perez, now assistant attorney general for civil rights, to succeed Hilda Solis in the U.S. Labor Department's top job. Solis left on Jan. 5. Perez held the state labor post from 2006-2009, before the Justice Department post. He was in Justice's Civil Rights Division before, and was a Montgomery County, Md. councilman - its first Hispanic-named council member - from 2002-2006. Mason said Perez was not only "very capable, but he understands federal, state, and local government" and forged "good relationships" with unions. Perez served under pro-worker Gov. Martin O'Malley, a potential 2016 Democratic presidential hopeful. Perez also forged relationships with business, Mason said. He understands "you need to compromise" to get pro-worker measures through legislatures. Compromise has been notably lacking in the Nation's Capitol, at least as far as Congress' ruling Republicans are concerned. One top initiative Perez and Mason worked on together was to convince the Maryland legislature to crack down on employers who misclassify workers as "independent contractors," depriving them of rights and benefits and the state of tax revenue. The other was to shift adult job training programs from the state Education Department - which concentrates on K-12 schools - to the Labor Department, and to fund them. Perez also revived budgets for state labor law enforcement, Mason said. Perez "understands the American economy and the role businesses have in it," Mason explains. "But he insists workers have value and it should be respected." And Perez believes "it would be a mistake to put all businesses in an anti-worker box. Tom, because of his studied and deliberate approach to individual issues will identify employers who want to move forward and work with unions and workers, Mason said. In March 2009 Thomas Perez was nominatedby the Obama administration for the position of Assistant Attorney General - Civil Rights in the DOJ. President Obama intends to tap the nation's top civil rights enforcer as the new secretary of Labor, a choice seen as an opportunity to raise the department's profile as the White House tackles immigration reform. The expected nomination of Thomas E. Perez, the assistant attorney general for the Justice Department's Civil Rights Division, would make him the only Latino in the Cabinet at this point in Obama's second term. The nomination, which requires Senate confirmation, could face a backlash from Republicans over Justice Department activities. Notably, Perez has filed civil rights lawsuits against law enforcement officials — including one last year against Sheriff Joe Arpaio, the brash Maricopa County, Ariz., lawman. The suit accuses Arpaio's department of a "pattern of unconstitutional conduct" against Latinos in the state, which has led the nation in clamping down on illegal immigrants. An announcement of Perez's nomination is expected but is not imminent, sources familiar with the deliberations confirmed Sunday. The Labor Department post could play an important role in the president's second term, as Obama has made immigration reform a priority. One of the thorniest issues is the creation of a temporary worker program that Republicans want but that the president has not explicitly proposed. Because of his background and the policy implications for the workplace and employment, analysts say, Perez could become a leading voice on the issue. "He's a first-generation American, so in a way his story is the immigrant story," said Christine Owens, executive director of the National Employment Law Project, an advocacy group for workers. "He's always been deeply committed to immigrant workers' rights, and I do think he can bring both a professional and personal perspective as we implement immigration reform." 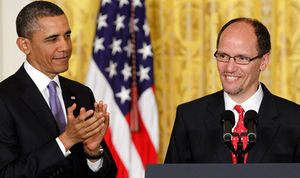 Frank Sharry, executive director of the immigrant rights group America's Voice, said Perez could become a champion for immigration overhaul. "He's the guy who's going to fight like hell," Sharry said. "He's not combative, but he's determined." Alumni of CASA de Maryland’s board include Cecilia Munoz, White House director of intergovernmental affairs, and Thomas Perez, assistant attorney general for civil rights. This page was last modified on 23 January 2018, at 15:25.